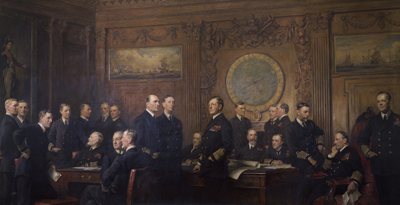 The Cope painting reminds me of Nicholson’s huge work called Canadian Headquarters Staff, 1918. It is at the Beaverbrook Collection of War Art in the Canadian War Museum, Ottawa. Both paintings seemed to avoid the normal nationalist glamour and theatrical drama associated with winning World War One. Rather they are quiet, thoughtful and perhaps a touch anxious.